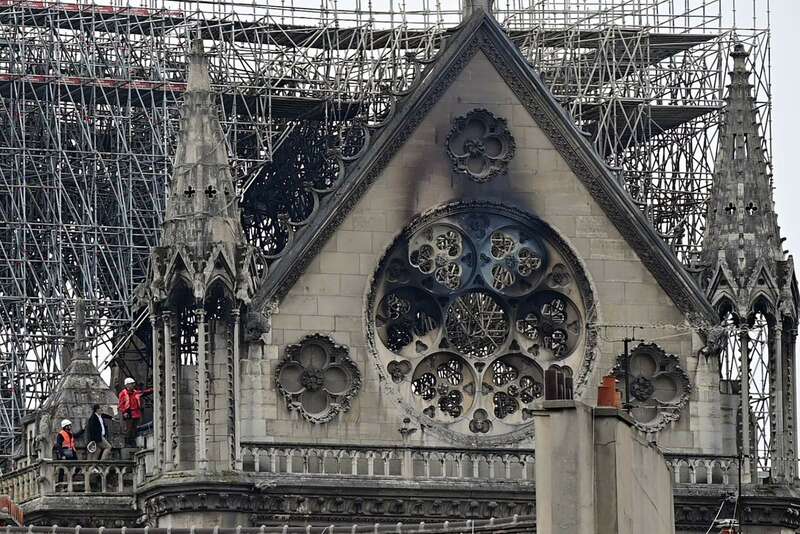 More than a church went up in flames in the Parisian fire this past Monday night, which destroyed much of the interior of the cathedral Notre Dame, though left the stone façade seemingly intact. Author Ken Follett called the medieval cathedrals in Europe “the pillars of the Earth”. Notre Dame de Paris, “Our Lady of Paris”, built between the 12th and the 14th centuries on the Ile de la Cité, the larger of the two islands in the river Seine in the heart of Paris, counted undoubtedly among them in its incomparable Gothic splendor. Past tense is appropriate now, as the fire has ripped the heart out of the building. The body of the church from the transept in the middle up to the two towers and down to the choir has been burned, leaving only the bare side walls standing. Yet a first look in the morning after the fire, with the last ambers barely extinct, seemed to allay the worst fears of seeing a building in ruins. The frontal view – though distant due to the police barricades blocking off half of the island, including the famous Cathedral Square Parvis de Notre Dame, a familiar sight to any and all Paris tourists ­– is reassuring. Both famous clock towers, known to millions around the world as the haunts of the “Hunchback of Notre Dame”, are still standing, barely blackened. A first look in the morning after the fire, with the last ambers barely extinct, seemed to allay the worst fears of seeing a building in ruins. Quite another sight however from the back of the cathedral. The quays of the smaller sister island Ile St. Louis, immediately upstream from Ile de la Cité and the main bridge linking it to the Left Bank, offer a full picture of the disaster. The entirely wooden roof of the church is totally gone, the metallic scaffolding surrounding it for the said renovation blackened, bent and partly collapsed. The sparkling, rose shaped stained-glass windows on both ends of the transept, even though looking intact from a distance, appear dark and blind. No wonder then that dozens of TV transmission vans are parked there and thousands of spectators mingle. To the right of me, a Belgian reporter changes seamlessly from rapid fire French to guttural Dutch to comment for his TV audience at home. To my left, Jack Lang, iconic minister of culture of the late president François Mitterrand, gives an interview to the US channel NBC besides a van with London licence plates. Behind me a reporter of Svensk TV closes the door to his van with Stockholm plates (not quite 20 hours after the outbreak of the fire!) and a few steps further is parked a sleek Mercedes van from the main German public TV Das Erste. At least Europe, if not the world, Christian or otherwise, seems to skip a beat in the face of seeing such a symbol of Western and Christian seemingly gone. The conspiracy buffs already have had a field day. The fire broke out an hour before a scheduled major speech by French President Emmanuel Macron, transmitted by the major TV channels, detailing the government’s answer to public dissatisfaction, spearheaded by the “Yellow Vest” movement. When Macron cancelled his speech due to the unfolding disaster at Notre Dame, some yellow vests speculated that the calamity’s timing did suspiciously help Macron to switch to his favorite role of “pater patriae” (father of the country) in a dark hour for the nation. Which, truth be told, he did with a slightly pathetic TV allocation for a call to national unity and resolve to rebuild. On the extreme right, in a surprising parallel between the respective pundits in the US and France, dark mutterings of an Islamists plot instantly arose. Of course, the twittering world champion in the White House did react instantly, too. With appropriate words of commiseration was mingled a piece of free advice to the French firemen: “flying water tankers”. It took the French authorities barely a half hour to point out that trying to extinguish this particular fire by dropping massive amount of water from above carried too many risks of even more damage done. In the end the Paris Fire Brigade did, according to experts in the media, a very credible job being able to save the towers and most stone walls. They also evacuated some priceless treasures from inside the blazing building. One picture that went around the world was the church’s spire, high over the transept falling in a flames – the medieval one having been brought down by the French revolutionaries at the end of the 18th century, the burnt one actually being a replica built in the 19th century. A symbol was crashing down. And in such moments is wider meaning invested, so hereby hangs a tale of politics. Macron’s France appeared for many to be the main bastion of European resolve when he first came to power, especially with Angela Merkel weakened and on her way out, Britain’s self-inflicted wound with Brexit, Italy’s neofascist embrace and the national-populists taking over in Eastern Europe and surging in Northern Europe. Then came the yellow vests, devastating the iconic Champs Elysées, scaring away tourists from all over the world from a seemingly archaic France. And now with Notre Dame charred and broken, how can anybody still rely on the enduring values of Europe, enshrined in its cultural heritage and its past global influence? If the Notre Dame fire coud lead to a short-lived national consensus, coupled with rallying around the chief, it could actually help the “internationalist”, pro-European side in French politics, concentrated in the person of Macron and his La République en Marche party, and beyond. The first such signs are appearing in France. Almost a billion Euros was pledged on the first day of the international campaign to rebuild Notre Dame in all its past glory. A big part of this generousity came from French multinationals and rich individuals. But a considerable sum also through small donations from “the people”. They are heeding Macron’s call. Will they follow him, in France and beyond in his call for more European “nationalism”, necessitated by surging authoritarian nationalism from China, Russia, Turkey and the US of Trump? The elections to the European parliament at the end of May will be a first test.